Serious question: If Michael Vick was the No. 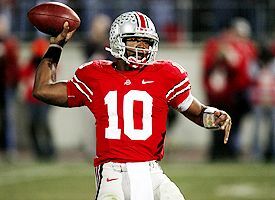 1 pick in the NFL draft, why can't Troy Smith be? 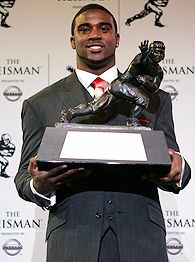 Don't let the Heisman jinx fool you: Troy Smith can excel at the NFL level. I'm talking strictly in terms of College Vick vs. College Smith. Don't say Vick is superior because of speed. Most human beings concede Vick could probably outrun a Concorde jet. But since when is that a requirement for an NFL quarterback? Don't say the freak factor. This isn't a PlayStation game. Don't say passing. Smith makes throws Vick can't make right now. Not to mention, Vick completed barely a little more than half of his passes his final year at Virginia Tech (54 percent) while throwing for 1,234 yards and eight touchdowns. Compare that to Smith's astonishing senior season -- 67 percent completion rate, 30 TDs and a mere five interceptions. Smith transitioned from running quarterback to accurate pocket passer. We're still waiting for Vick to make that transition. Don't say decision making. Check the touchdown-to-interception ratio again. Smith, who is just now being considered a top-15 pick in the April draft, can read defenses better than past and present Vick. Don't say body of work. Smith is 10-1 against ranked teams and is the only quarterback in Ohio State history to beat Michigan three consecutive times. Smith has never shrunk in a big game. 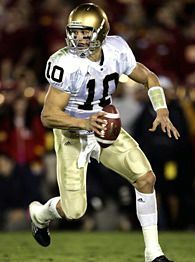 Brady Quinn has (see: Michigan this year). Don't say height, either. Depending on who you believe, Smith is either an inch taller or shorter than Vick (who is listed at an even 6 feet). And for those who have issues with Smith's height, here is some trivia for you: Name the next quarterback selected after Vick in the 2001 draft. Give up? Answer: Drew Brees, who is barely 6 feet tall. Smith has carried Ohio State more with his accurate arm than his speedy legs. Yes, the same Brees who is having the finest season of any NFL quarterback. The same Brees who dissected the Cowboys on Sunday night. The same Brees who has now successfully piloted two franchises (San Diego and New Orleans). Coming out of Purdue, Brees had superb numbers but slipped to the second round because he was a shrimp by NFL standards and supposedly not strong enough to take the weekly beatings. A quick refresher: Atlanta traded with San Diego so the Falcons could move up and take Vick at No. 1. In return, San Diego got LaDainian Tomlinson at No. 5 and Brees with the first pick of the second round. Think Atlanta wants a do-over? Think the Miami Dolphins, who elected to sign the taller, more athletic Daunte Culpepper over Brees last offseason -- officially a dumber decision than the Texans' passing on Vince Young and Reggie Bush -- want a do-over? In 2001, everyone was so gaga over Vick's athleticism that nobody bothered to question whether he could regularly complete half of his passes. In Troy Smith, we have a quarterback who does all the right things, and yet he might as well be Gino Torretta. NFL scouts will make the same mistake with Smith that they did with Brees. It's absolutely criminal that some people still consider Michigan State's Drew Stanton (never had a single defining win) and LSU's JaMarcus Russell (immense physical talents but not polished yet) better draft prospects than Smith. Brady Quinn has done nothing in college to prove he's a better prospect than Smith. It never fails. Every year one player's flaw takes on a whole new level of ridiculous importance. Last year, Vince Young annihilated virtually every defense in college football, but his Wonderlic test all of a sudden became stupidly significant. This year, it's Smith's height. The critics act like an ewok is trying to become an NFL starter. On the other side of it, Quinn's coach and his offensive system are already the most overrated traits of any prospect. I'm not trying to take anything away from Quinn, who put up the numbers to justify his being the No. 1 pick in April, but there were very few games in which his presence alone was responsible for the Irish's winning. You never got the feeling he won the game. Besides, Quinn's most defining win this season was a comeback against a bad Michigan State team. Notre Dame hasn't beaten a top-10 team since Charlie Weis arrived in South Bend. Quinn has yet to win a bowl game and he perennially gets served up by rival USC. But there is your Maxwell Award winner for the best player in college football. Meanwhile, there were at least half a dozen games in which Smith was the most powerful force on the field. Every Michigan game. The Penn State and Texas games this year. Iowa -- this year and last year. And, of course, Notre Dame in the 2006 Fiesta Bowl. Against Michigan, the best defense that both Quinn and Smith faced, Quinn threw for 234 yards and three touchdowns. Smith bombed them for 316 yards and four scores. Quinn's 4-inch advantage over Smith couldn't be more overestimated. Everything about Smith screams he is the wrong player to overlook. Yet that is exactly what will happen in April even though he had a college career that was better than one of the most glorified quarterbacks in recent memory. But in the NFL, measurements are more valued than film. Stopwatches are trusted more than instinct. At least there is one good thing that comes from Smith's not being a top-five pick. He's less likely to be drafted by the Detroit Lions.